This coupon will come in handy with the Pillsbury catalina that is printing at Fred Meyer, Albertsons and Safeway! 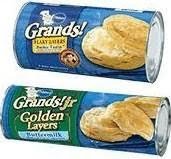 Print this $1/2 Pillsbury Flaky Grands! Biscuits coupon. You can print two coupons per computer by clicking on the original link. Plus there are a couple match-ups with cellfire and shortcuts to do this deal at Safeway. If you have the Nabisco Back to School coupon book, don't forget to save your Capri-Sun and Nabisco receipts for the $20 2010 rebate.